There is a lot of competition for BC’s water—in fact it’s more difficult to think of things that water isn’t needed for in BC. It drives entire ecosystems and provides water flows for fish and other wildlife, and people need it for drinking, electricity generation, irrigation, and recreation. With so many uses and users, there are bound to be conflicts and difficulties in managing water in a way in which all users have access to the water they need. In 1998, in an attempt to improve water management, the government of BC, under the Water Act, requested that BC Hydro undertake a Water Use Planning process to review the operating conditions of BC Hydro’s power generation facilities. Initiating the largest ever water restoration project in BC, a Water Use Plan (WUP) was to be produced for each of the facilities (30 facilities within 27 watersheds) and approved by the Provincial Water Comptroller. Based on each WUP, the Water Comptroller has the power to amend the water licences for each of BC Hydro’s facilities taking into account the WUP recommendations pertaining to the operation of the facilities—for some facilities, interim orders under the Water Act were issued requiring immediate changes to operations for the benefit of fish. By the end of 2003, 24 WUPs were either complete or nearing completion and Watershed Watch recognized the need for an objective analysis of the overall process examining whether or not goals were met regarding improving water flows for fish. We contracted Quadra Planning Consultants Ltd., Regional Consulting Ltd. and environmental lawyer Linda Nowlan to produce the report Preliminary Review of Fisheries Conservation Gains within BC Hydro’s Water Use Planning Process. Watershed Watch was heavily involved with the development of the Coquitlam-Buntzen Water Use Plan, working closely with our neighbours the Kwikwetlem First Nation, and as part of the Coquitlam-Buntzen water use planning consultative committee, the Coquitlam fish technical committee, the First Nations water use planning committee, the fisheries advisory team on water use planning, the green hydro working group, and taking part in numerous other academic, technical, and informal meetings. Although attending over 70 meetings may not be glamorous work, the WUP resulted in significantly improved flows for fish downstream of BC’s oldest dam—a major achievement. The Coquitlam-Buntzen WUP also provided a unique opportunity to investigate the feasibility of restoring sockeye to the Coquitlam River—a long time dream of the Kwikwetlem First Nation whose name literally means “Red Fish up the River”. Watershed Watch is a science advisor to the Kwikwetlem First Nation in their efforts to restore the Coquitlam River and Coquitlam River sockeye. There is a lot of competition for BC’s water—in fact it’s more difficult to think of things that water ISN’T needed for in BC.It drives entire ecosystems and provides water flows for fish and other wildlife, and people need it for drinking, electricity generation, irrigation, and recreation.With so many uses and users, there are bound to be conflicts and difficulties in managing water in a way that all users get the water they need. In 1998, in an attempt to improve water management, the government of BC, under the Water Act, requested that BC Hydro undertake a Water Use Planning (link to BC Hydro’s WUP page) process to review the operating conditions of BC Hydro’s power generation facilities. 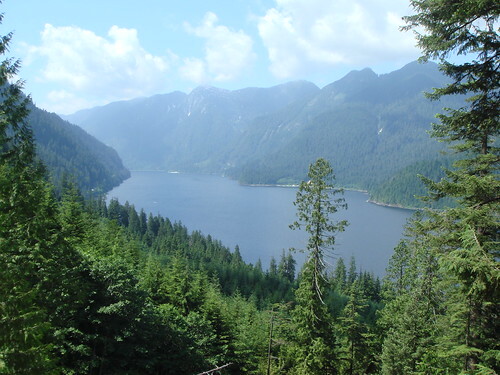 Initiating the largest ever water restoration project in BC, a Water Use Plan (WUP) was to be produced for each of the facilities (30 facilities within 27 watersheds) and approved by the Provincial Water Comptroller. Based on each WUP, the Water Comptroller has the power to amend the water licences for each of BC Hydro’s facilities taking into account the WUP recommendations pertaining to the operation of the facilities—for some facilities, interim orders under the Water Act were issued requiring immediate changes to operations for the benefit of fish. The Coquitlam-Buntzen WUP also provided a unique opportunity to investigate the feasibility of restoring sockeye to the Coquitlam River—a long time dream of the Kwikwetlem First Nation whose name literally means “Red Fish up the River”. Watershed Watch is a science advisor to the Kwikwetlem First Nation in their efforts to restore the Coquitlam River and Coquitlam River sockeye. A Metro Vancouver website, Working together for Coquitlam Watershed and Kwikwetlem Sockeye, contains video links from a June 16, 2010 community meeting in Coquitlam including presentations by representatives from Kwikwetlem First Nation, Kwikwetlem Salmon Restoration Program, BC Hydro, Metro Vancouver, and Watershed Watch Executive Director, Craig Orr, as well as poster board displays and copies of the presentations by the designated speakers. Also included are links to other resources, such as media releases, web sites, and contact information that provide more information on efforts to restore the Coquitlam River and Coquitlam sockeye.